Old one, but a good one. I was about to just suggest a fan, but looks like someone else beat me to the punch and with a better recommendation. hm, the thing about that is my case already has 2 80mm fans built into the side panel that are right over the VCs. (along with the usual 120 at the front and 120 at the back of the case). what i am seeing is that the hot air rises up from the bottom card and heats the top. after it goes to the second one it escapes through the back of the case, but by then its too late as the second card is already heated. Can we get a picture? Maybe you need to force more air in between the cards to push the hot air out the back or just throughout the rest of the case. 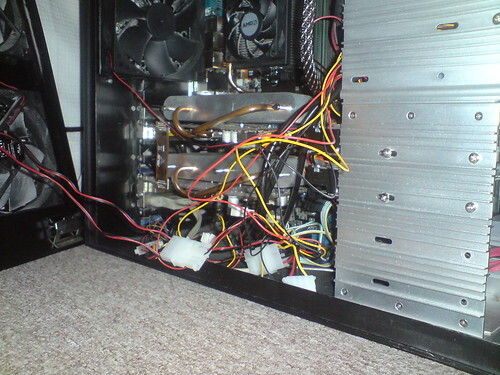 ps: those wires arent in the way, its a trick of the camera angle. note the door fans on the left. Have you changed the thermal paste or is it stock? its stock, and changing it is probably where i would begin. i just figured since one of them is 20c more than the other it might be something to do with my configuration. maybe i will just use 2 standard aftermarket coolers, i didn't know if there was anything made for SLI or small enough to work with sli. Clean and reapply AC3 or 4 or whatever it is now. Maybe the HS just needs to be mounted better on the hotter one?